Indigenous leader Jackie Huggins wants more work done to close the gap. The Co-Chair of the National Congress of Australia's First People, Jackie Huggins, has called for stronger partnerships between Aboriginal and Torres Strait Islander communities and policymakers in order to close the gap. She blames the Government's failures to close the gap on too much shuffling of roles amongst bureaucrats and politicians and failure to properly implement on-the-ground services. 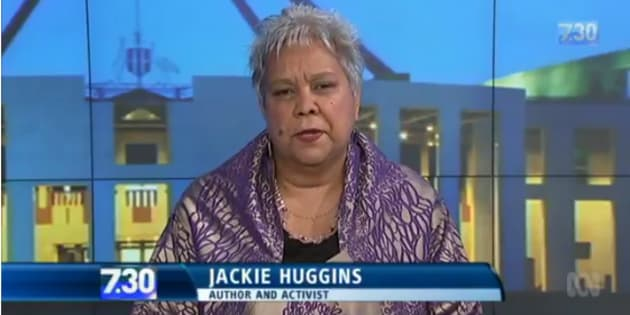 Appearing on the ABC's 7.30, Huggins said the details of the ninth annual Closing The Gap report which was released on Tuesday is a "sad reflection on Australia" and shows the worsening stature of Indigenous Australians. "I think that there certainly needs to be a partnership between the Aboriginal and Torres Strait Islander community... and the policymakers with the bureaucracy in the Government," she said. "It's very difficult, because I think that you have a whole moving on of bureaucrats, of people who are dedicated to those positions, and they move on all the time. Unfortunately, when you lose that core business, that corporate knowledge, then, unfortunately, it is a problem." The comments come after the Closing The Gap report revealed only one of the seven Closing the Gap targets will meet its target for this year. There has been little to no progress on Indigenous life expectancy, mortality rates, employment rates and reading and numeracy levels, although the target to halve the gap in Year 12 attainment by 2020 has remained on track, according to the report. "It's getting worse, really. That's a sad reflection on Australia as a very rich nation in terms of Aboriginal people - we are the sickest and the poorest, and the least housed, job-wise... Every social statistic in our country is with Aboriginal people at the lowest ebb," Huggins told 7.30 host Leigh Sales. Despite $500 million in cuts to Indigenous services in 2013 and low levels of communication between politicians and Indigenous communities, there has been some government investment into closing the gap -- it just hasn't reached its targets, according to Huggins. "There's been significant Government investment in the children attending school, particularly in remote areas, in the Northern Territory, West Australia, Queensland. I think that it comes with Government investment," she said. "What that has not been able to meet is the full implementation of our services on the ground. So, something drastically is happening here that is so wrong, Leigh - we need to fix it, and we need to find a better way to do this." In an address to Parliament on Tuesday, Prime Minister Malcolm Turnbull said that progress on Indigenous issues overall is too slow. "We are still not making enough progress," he said. "This report demonstrates that all Australian governments have much more work to do. "I firmly believe that people must be involved in the process in order to be engaged in the outcomes... It has to be a shared endeavour." For Huggins, significant progress needs to come through Indigenous communities, services and peak organisations in partnership with policymakers. "I hope it will get stronger and more meaningful, and that we really look at the way that these issues can be fixed within our own communities, through the eyes of Aboriginal and Torres Strait Islander peak organisations and other services."